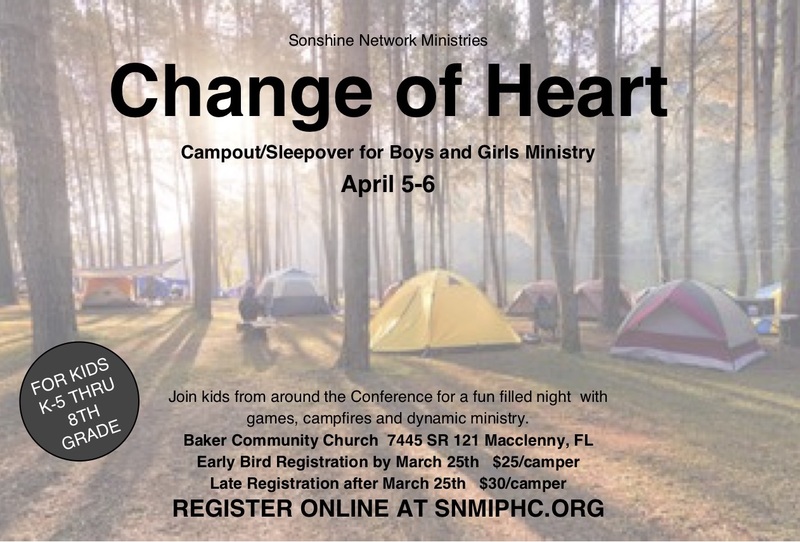 Last year over 65 kids attended the first SNM "Change of Heart" Campout and Sleepover for boys and girls. Join us at Baker Community Church at 7445SR 121, in Macclenny, FL just off I-10 west of Jacksonville. There will be lots of activities, a bonfire, food and fun! This year we hope to have over 100 kids in attendance in the Northeast Regional event. Bring all your church kids and their friends, plus tents and sleeping bags. The $30 registration fee will cover all activities and food. Activities and camp set-up will begin at 4pm on Friday, April 5th and end Saturday afternoon April 6th. Need more information? Contact Josh Johnson at 904-445-9763 or Cindy Forstall at 850-228-9080.